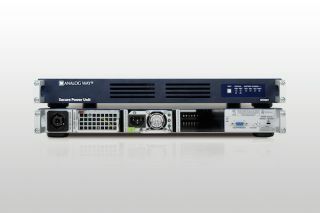 Analog Way has introduced the Secure Power Unit, an external power accessory compatible with three models of the LiveCore series of Premium Switchers. The Secure Power Unit (Ref.SPU001) is a new power protection module designed for the SmartMatriX Ultra, Ascender 32 and Ascender 48. The unit features dual power supplies providing redundancy against branch circuit failure or unstable power. Its battery module provides approximately 10 minutes in case of mains loss, thus offering time to restore power or back up the system. The Secure Power Unit can be managed from the Web RCS, the user interface designed for the LiveCore series, offering advanced status monitoring. This can be achieved by simply connecting an included RS232 cable between the LiveCore device and the Secure Power Unit. The new Secure Power Unit will start shipping by late April.